This Situation Update describes events occurring in Kyainseikgyi and Kawkareik Townships, Dooplaya District during the period between January and April 2017, including healthcare, education, military activity, refugee repatriation, environment and drugs. Although the military situation in Dooplaya District is stable, between the period of January and April 2017, the Tatmadaw remain very active in Dooplaya District. They regularly patrol in civilian areas and temporarily stay in local monasteries and villagers’ plantations. As the graduation certificates of two new post-twelve schools in Kawkareik Township, Dooplaya District, the English Immersion Program (EIP) and the Teacher Preparation Centre (TPC), are not officially recognised by the Burma/Myanmar government education department, graduate students from these schools face barriers gaining employment after graduation. Since 2016, local villagers in Dooplaya District have been concerned about the return process for refugees in camps along the Thai-Burma Border and whether they will be able to secure their livelihoods when they return. 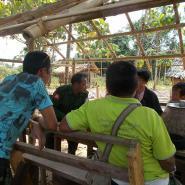 On March 27th 2017, Noh Poe refugee camp leaders collaborated with many other organisations to conduct an assessment about refugee repatriation to Htee Nya Paw village, Kyainseikgyi Township, Dooplaya District. The following Situation Update was received by KHRG in May 2017. It was written by a community member in Dooplaya District who has been trained by KHRG to monitor human rights conditions. It is presented below translated exactly as originally written, save for minor edits for clarity and security. This report was received along with other information from Dooplaya District, including six interviews, 208 photographs and 23 video clips. This Situation Update describes events occurring in Noh T’Kaw [Kyainseikgyi] and Kaw T’Ree [Kawkareik] Townships, Dooplaya District during the period between January and April 2017, including healthcare, education, military activity, refugee repatriation, environment and drugs. The healthcare situation in Kaw T’Ree [Kawkareik] Township, Dooplaya District during the period between January and April 2017 has improved compared to the previous two years [2015-2016]. Health worker teams under the control of the Karen National Union [KNU] tried to provide as many healthcare services to civilians as possible despite an inadequate amount of available funds. During the period between January and April 2017, there has been an increase in healthcare and hygiene awareness as many local villagers and health workers have been trained. Consequently, there are more health workers to provide healthcare services to the community. Education in Dooplaya District has also improved because there are now two new post-twelve schools: English Immersion Program [EIP] and Teacher Preparation Centre [TPC] have moved to Kaw T’Ree [Kawkareik] Township, Dooplaya District [from refugee camps along the Thai-Burma border]. EIP moved to Kaw La village, Su K’Lee village tract, Kaw T’Ree [Kawkareik] Township in 2014 and TPC moved to the area between Maw T’Raw Hkee village and Mae T’Raw Hta village, Mae T’Raw Hta village tract, Kaw T’Ree Township in 2016. Thus, students who graduate from high school [and live near the EIP and TPC] can continue their studies near their home villages. Therefore, these schools have improved the education situation [in Dooplaya District]. Unfortunately, the [graduation] certificates given by the TPC and EPC are not officially recognised by the Burma/Myanmar government education department [and they therefore face barriers if they want to get government employment]. Moreover, the TPC and EPC need further support [increased finances and greater teaching capacity] in order to work on a greater amount of education activities. 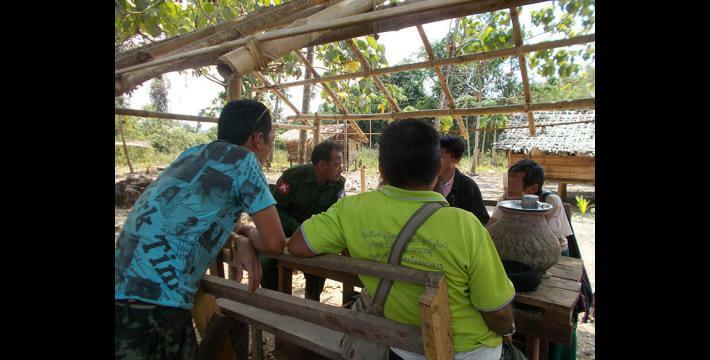 As the Tatmadaw camps based in Dooplaya District were active and Tatmadaw troops also patrolled in the community’s monasteries, [stayed in] villagers’ tents/farmhouses, and villagers’ plantations, local villagers were concerned about their security. Since 2016, local villagers in Dooplaya District have been concerned about the repatriation process for refugees in the camps [along the Thai-Burma Border] who have been living there for over two decades. They are concerned about whether the returning refugees will be able to secure their livelihoods. 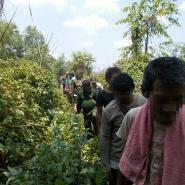 Thus, since the situation of Burma/Myanmar has gradually improved, refugees wanted to return to their places of origin. Some refugees returned to their original areas, but others have not. If refugees return without arrangements for land and plantations or without financial support from domestic or international organisations for at least one year, they may consequently face many difficulties. In terms of health they will face difficulties to pay medical costs, in terms of education, they will face difficulties paying for school materials and tuition fees and in terms of livelihood, they will face difficulties because farming takes time to bring a harvest. Therefore, local villagers reported that the newly repatriated refugees may face a lot of difficulties unless each household is supported with at least 3,000,000 kyat [US $2,256.10] because they lack raw stocks [such as vegetables/crops and rice] to sell to meet their household needs. On March 27th 2017, refugee camp leaders collaborated with several organisations including The Border Consortium [TBC], Karen Refugee Committee [KRC], American Refugee Committee [ARC], Karen Women Organization [KWO], Committee for Internally Displaced Karen People [CIDKP], Karen Human Rights Group [KHRG], as well as the Karen National Union [KNU] Dooplaya District and Township administrations to conduct a survey to assess the potential repatriation of Noh Poe refugees to Htee Nya Paw village, Kyainseikgyi Township, Dooplaya District. On March 31st 2017, Civil Society Organisations [CSO] met local authorities to discuss the potential refugee return. However, the decision was not finalised because the official decision is planned to be announced next month in April . There is a plan to increase awareness to all citizens [through workshops] about how the conservation of the natural environment and forest maintains a sustainable environment, and replant trees project leaded by KNU Forestry Department. Some villagers have been maintaining a sustainable forest in order to preserve the land for the next generations to use. Although they have not yet achieved significant successes, many people expect that the environmental situation will gradually improve. Villagers hope that wealthy individuals and powerful armed actors will be collaboratively working together in order to improve the environmental situation until villagers reach their dreams and goals. In March and April 2017, the KNU police have been trying to reduce drug use in Kaw T’Ree Township, Dooplaya District by testing suspects’ urine and conducting investigations. If the test results show that the person is using drugs, the police issued a fine of 100,000 kyat [US $75.12] as punishment. 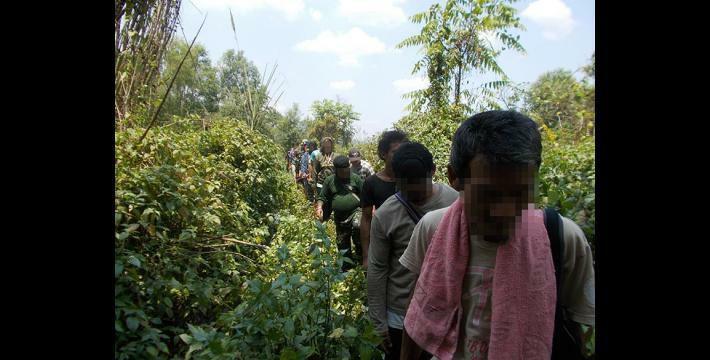 In cases such as this in which the suspect is caught with drugs, they [the KNU police] proceed according to the law [keep people caught in custody]. Due to this, drug use has decreased overall, but has not been eliminated. The community remains uncertain about what will happen with this in the future [if the situation will escalate]. All conversion estimates for the kyat in this report are based on the February 22nd 2018 official market rate of 1330 kyat to US $1.